Everyone in the known world is cawing about The Hunger Games. Team Peeta, Team Gale, Effie Trinket's getups, and on and on. Whether you devoured the trilogy in a single train ride, lined up at 8 AM for the midnight movie premiere, or avoided Twitter for the last, oh, 6 months in the hopes of avoiding any mention of the plot points you have yet to reach in your Hunger Games consumption odyssey, you are not going to want to miss the official Capitol Tour that Windows Internet Explorer and Lionsgate created. 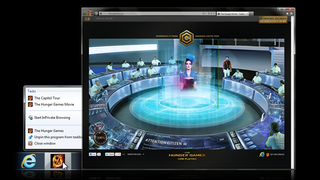 The virtual Capitol Tour is an immersive companion site to the movie featuring exclusive content from director Gary Ross and the movie itself, like footage of Effie at the Reaping, Katniss and Peeta in the Capitol and a new message from President Snow. It was built using only HTML5—unprecedented for movie sites which are almost 100% Flash based—and is plug-in free. Developer touches like skewed HTML5 video, procedurally generated particle effects, and cinemagraphs are hiding in the experience. The behind-the-scenes video at left features designers and developers from partner agencies the Nerdery and Ignition Interactive talking about how they made the Capitol Tour come to life. Take the Capitol Tour here, and for the fastest and most fluid experience, take the Tour using Windows Internet Explorer 9.